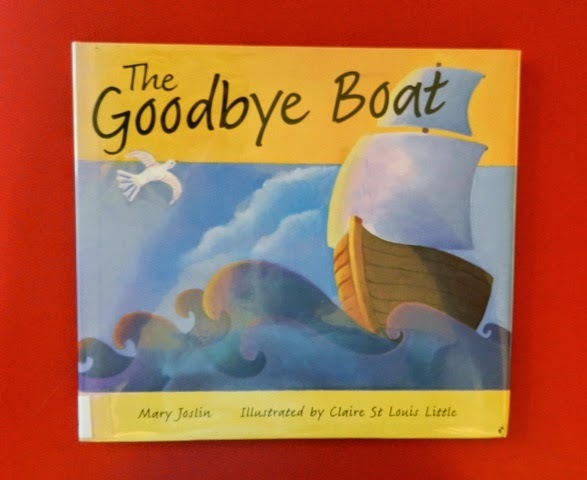 Summary: This simple, thoughtful text involves 2 children anticipating and then saying goodbye to an elderly woman who gets into a boat and sails away. Very real emotions of pain, loneliness, and grief are shown while the evocative illustrations imply that she is leaving them because of her death, but it is not clear. The ending involves a hopeful sense that she is going somewhere new. Hanna’s Comments: The 3 characters are described as friends. This ambiguity opens this book’s use for any community context, not just family, where a beloved person has died. Because the elderly woman’s leaving & destination are not defined, this book can be a tool for exploring other kinds of permanent goodbyes such as when someone is moving far away or into a permanent nursing home situation. The ambiguous but positive ending will encourage a discussion of beliefs about the afterlife.